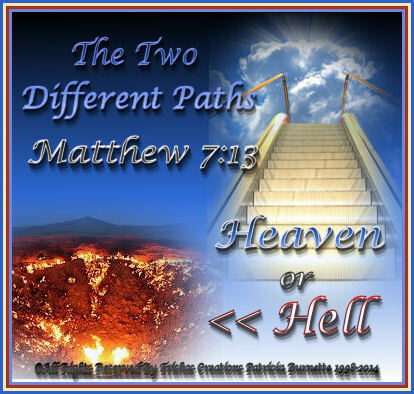 Welcome to "The Two Different Paths"
Jesus talks about two different paths we can take in our lives, the broad way and the narrow way. Broad way leads to destruction where there is room for the fleshly things such as: bitterness, unforgivness, hate, resentments and vindictiveness. But the narrow path - way there is only room for the Spirit. The flesh is easy to take the broad path, but the end result is complete destruction, it is much more harder to take the narrow path but in the end it leads to life. Our emotions tempt us to take the easy way to do what feels good for a minute or moment. Wisdom moves us to take the way that seems hard at first, but later we find it leads us into life eternal. We will be with Jesus! When we come to Jesus Christ, our lives are changed right then, but if we choose to not accept Jesus Christ as our personal savior, then we can assume that if we keep living the sinful life we are wanting to live we will go to hell. Jesus Christ, doesn't push himself on anyone it's our choice to make, but if we choose not to follow Jesus Christ then we will end up in a path that we wish we didn't choose. Believe me, Hell does exist and if we do NOT change our lives and change how we live and think hell will be the eternity that you cannot get out of no matter how many times you plead to get out and change. It's to late then... what would happen if you didn't change your sinful ways and then something happened and you ended up in hell? Where do you think you would end up? Will you think again?? But, it will be too late to make any choices, it will be too late to ask Jesus to forgive you of your sins and come into your heart. The path however to Heaven, wow now that's a awesome choice! Heaven, is awesomely gorgeous and if we choose to live for Jesus Christ and ask him to come into our hearts, we will go to Heaven and live eternally forever with Jesus Christ. The path is narrow and only few find this path. Why? Because we have to change our lives, we have to strive to be perfect, we have to follow Jesus in every aspect of our lives, we have to place Him first in our lives not just once in awhile but all the time. We must believe in Him, trust Him in all there is in our lives, if we don't the Bible says, those without faith the works are dead. Faith without works is dead, if we have faith as small as a mustard seed then we can see things happen in our lives, that only God can give to us. But, just because we have faith doesn't mean we go to heaven.... we have to live for Jesus Christ, we have to change our way of living, we have to walk the walk, talk the talk and truthfully hinder to the Voice of God and do His will. Heaven is such a peaceful and beautiful place, there is no sin, no sickness, no strife, no death, no turmoil , no hate, no tears.... everyone is in peace and lives fully in God's precious presence. We are changed into a immortal body, we are changed in a twinkling of an eye. Those whom are sick will be healed and with their loved ones they shall see Jesus! But again, those who choose to sin and live a sinful life, shall never see Him, they shall not dine with Him, they shall not see the beautiful gates of pearls, the streets of gold.... so which path way do you choose ? If, you choose Jesus, let us know and we will ADD your Name to the "I Plead The Blood of Jesus Page" here. So all the people around the world shall see you claimed Jesus Christ as your personal Savior and YOU NOW LIVE IN HIM!